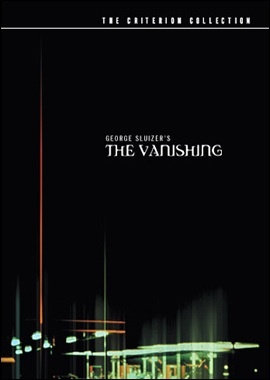 George Sluizer's The Vanishing (Spoorloos) masquerades as a mystery-thriller in order to expose the structure of the genre itself. This suspenseful film actually contains many comic moments; in fact, it's founded on a subtle, dark irony that revels in pulling the curtain of suspense back to reveal the mundane reality of a terrible crime. In addition to exploring the motivations of a thriller, The Vanishing uses its examination of a sociopathic kidnapper, Raymond, and an obsessive selfish husband, Rex, to obliquely tackle the question of solipsism — the inability to truly share one's experience of life with another person. Although The Vanishing fits in the "missing woman" category of suspense thrillers (see Hitchcock's The Lady Vanishes), it self-consciously toys with audience expectations so subtly that the viewer easily can get caught up in the very devices the movie works to undermine. A married couple, Rex and Saskia, go on vacation, and Saskia disappears. The rest of the movie focuses on Rex's increasingly obsessive attempt to find out what happened to her. The fairly simplistic plot structure betrays both Sluizer's skillful manipulation of genre norms as self-parody as well as his keen psychological insight. Early in the film, when their car runs out of gas in a dark tunnel, and Rex leaves Saskia alone to find a gas station, one expects her to be abducted. Sluizer includes all of the essential elements of the dangerous situation: solitude, darkness, feminine vulnerability, alien surroundings and anxiety-inducing music. Nothing happens. When Raymond, the kidnapper, finally takes Saskia, he does so in broad daylight, in a crowded public place, in clear sight of Rex. What Sluizer cuts through here isn't the naïve misconception that only dark alleys are dangerous, but rather an audience's expectation that the terrible event will happen in a suitable mise-en-scene. The Vanishing's efficacy springs from Sluizer's refusal to bend to genre expectations. On top of this, he allows his film a self-reflexive irony, so that this refusal can be read not only as an avoidance of clichéd devices, but as a statement on the devices themselves — an opposite tactic than the standard thriller, which tries to support our suspension of disbelief by utilizing the same old tricks "better." Rather than falling back on the typical whodunit method of storytelling, Sluizer instead takes us through the meticulous and intimate details of how Raymond planned, practiced and executed the kidnapping. This crime-procedural may not raise many eyebrows in today's overabundance of pseudo-psychological crime thrillers, but The Vanishing stands head and shoulders above its peers by emphasizing the banal humanity of the kidnapper. In a sequence that mixes the absolute chilling reality of sociopathy with a hilarious sequence of trial-and-error, Sluizer shows how a typical criminal "mastermind" is constructed. 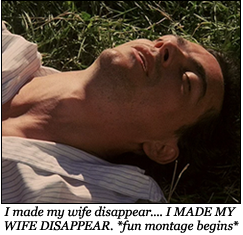 Raymond, an upper-middle class chemistry teacher, systematically builds his kidnapping plot, testing his anesthesia on himself (on a comfortable barn floor), approaching various women as he hones his approach and pick-up lines (necessary to get the woman to willingly enter his vehicle), and masking his inherent masculine threat via various pretenses. Unlike Silence of the Lambs, which creates fear of the killer by accentuating his bizarre psychopathy, The Vanishing instead points out how calm and normal Raymond behaves, both in his family life and in the planning and execution of his crime. This toys with the standard expectation of the criminal mastermind, or its comedic obverse, the woefully incompetent doofus, by presenting a wholly normal person. Raymond exemplifies the bourgeois citizen in his dress, his manner, his lifestyle, and, in the main point Sluizer wishes to make, his amoral violence. Rather than pointing out the cliché "the killer could be one's neighbor," Sluizer instead postulates that he already is one. Random, irrational violence is an inherent quality of the bourgeois middle class. The real shock comes from the revelation that our inhibitions exist, that the barely stifled appeal of violent irrationality remains so long unactualized. Later in the film, as Raymond explains how he discovered his sociopathy to Rex, he reveals that his sole motivation in kidnapping Saskia was that, in his mind, not kidnapping someone was his fate; in order to rebel against destiny, he must perform the ultimate illogical, unethical act. This symptomatic violence manifests itself out of boredom, out of curiosity, out of an intangible excess of humanity unable to fit into its socio-symbolic placeholder. Typically, the crazy bad guy embodies an obscene access to a sort of infernal jouissance, a pleasure denied to those who follow the rules. Raymond clearly lacks this excess pleasure: he exhibits few, if any, signs of sadistic glee. This lack of pleasure-motivation creates a vacuum of meaning that causes the viewer to uncomfortably accept the utterly indifferent and quotidian nature of even the worst atrocities. The Vanishing also forces us to consider the fitting irony of how entertainment portrays The Sociopath. Rather than continuously sickening us with his dangerous, unpredictable violence, he integrates rather easily into our societal milieu. Consider famous fake sociopaths like Hannibal Lecter of Silence of the Lambs and Showtime’s Dexter Morgan. Both Lecter and Dexter are, above all, very likable characters, and they share one crucial feature: an ethos. Lecter dislikes vulgarity, rudeness and insincerity, something most people can relate to, and Dexter only kills "bad guys." He lives by his father's "code" (which, in psychoanalysis, is precisely the lacking symbolic reference point that creates psychopaths), which guides his supposedly otherwise random violence. That Lecter is often considered the enviously urbane hero of Lambs and that Dexter commands thousands of internet fans, who use message-board chats to cheer on the sort of comeuppance that goes unrealized in lives of impotent frustration, instantly explains how easily their acts can be rationalized by and integrated with a normal and "socialized" mindset. But Sluizer presents us instead with a total absence of ethics, an existential void from which the true sociopath operates. Raymond is not a particularly likable character and not just because he looks like Shaggy from Scooby-Doo after he finally walked down the baby boomer path of yuppiehood. Raymond, above all, lacks grounding in any principle or conviction. He simply operates moment to moment as opportunity arises, treating each incident as a discrete set of choices. Choice becomes Raymond's central motivation: we are told that, as a boy, he stood atop a window railing and looked down, thinking that there was no way he could jump off. Yet jump he did, because his will to choose overrode his instinct for self-preservation. Raymond's cold calculation differs from that of the typical criminal mastermind archetype in that, although his methods are altogether logical, he lacks the super power of getting everything right on the first try. He experiments, like a child, learning from his mistakes, toeing the line of morality to see whether or not he will be struck by lightning. One can almost taste his disappointment when he is not. It's not all fun and games, though. The movie does have a serious central theme, ruthlessly explored in the guise of a murder mystery: solipsism. The Vanishing is based on the book The Golden Egg by Tim Krabbe. The book's title clues us in to the solipsistic theme of the story. The eponymous golden egg reminds us of F.H. Bradley's philosophy of "the opaque spheres of subjectivity," the notion that each of us lives within a self-contained, impermeable bubble and are ultimately incapable of fully knowing or understanding another person. In the movie, the characters reference the golden egg twice, both times as dreams of being trapped inside a golden egg without hope of escape. Though we may all muddle through life as golden egg babies, The Vanishing explores a man's obsessive and self-destructive quest to break through his own subjectivity and share his missing wife's experience. After the kidnapping, one can't help but be put off by Rex's attitude toward discovering Saskia's fate. Instead of a compassionate, loving husband seeking out his dead wife in the interest of justice (or even base revenge), Rex seems more like a sociopath himself, searching out the details of the crime only to appease his own gnawing ignorance as to "what actually happened." In the later parts of the movie, Rex pursues Saskia's disappearance with another woman on his arm. He tells this woman that he doesn't love Saskia anymore — that, were she to show up, he would walk away from her. Whether Rex means this literally, or is simply humoring his woman-of-the-moment, he acts unmistakably callous to one woman or the other. After Rex had abandoned Saskia in the tunnel, he made a vow never to leave her alone again. Yet we are all alone all of the time, and no amount of will or effort can break through the necessary closing-off of our subjectivity. Thus, when Rex confronts Raymond about the truth of Saskia's disappearance, Raymond informs him that he cannot tell him what happened; he can only show him. Raymond believes the only way to truly know another person is to literally walk a mile in their shoes. But what Raymond wholly lacks and Rex misses throughout the movie, is that by understanding that every other person existentially experiences life — pain, fear, loneliness — one can make choices to lessen others' misery and feel compassion for them instead of contempt. Instead, Raymond offers Rex a choice: he can act out blind violent vengeance (which he initially does, in a hilariously ineffectual way), or he can bend to Raymond's will and truly experience what happened to Saskia. This latter suggestion satisfies the pathological obsession of both parties. Raymond may perform another irrational, cruel act against the inanity of the universe. Rex can satisfy his desire to know what happened to Saskia and, in a twisted way, share her experience, thereby symbolically honoring his promise not to leave her alone. The ending of The Vanishing has been described as the most chilling twist ever, but again Sluizer ironically gives all of his characters exactly what they want. Rex learns what happened to Saskia and shares, at a sublime level, her isolated subjective experience. 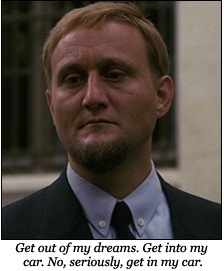 Raymond continues as a bourgeois sociopath, with no indication whether he will continue to abduct victims. Unlike most thrillers, the universe of The Vanishing lacks implied justice. What so chills viewers of this movie may not be the details of Saskia's (and Rex's) ultimate fate, but the fact that despite the emotional trauma of its revelation, the world as such keeps turning without skipping a single beat. This movie is a must-see, and I mean the original, not Sluizer's American remake with Keifer Sutherland. However, the Criterion DVD has zero special features, and the picture quality is pretty underwhelming. I would only recommend buying this DVD if you love this movie and want to watch it multiple times to examine the many subtle nuances of both Sluizer's expert storytelling and the powerful acting of the two male leads.